A good summary of projects which have pushed the envelope on information and place, divided well into understandable themes. The only downside is that, with the speed that things are happening in this field, the examples are bound to seem terribly dated within 2 to 3 years, and in some cases already seem to. I encourage any readers to push past the seeming clunkiness associated with printed screenshots of long-dead UIs; IMHO the ideas will stay good. Gordon and de Souza e Silva propose "net locality" to describe the nature of communications and society whereby location becomes a more important attribute and catalyst as data is augmented with location information and our primary and secondary channels of communication are mobile allowing us to move through and experience spaces with these new augmentations and filters. Most usefully the book is a cohesive summary of early experiments in games, social networks, and civic interventions that use this location-aware technology to change behavior and test new forms of interaction between people and space. The authors also do a nice job of revisiting place and social performance related social theory from the past century and a half—walking readers through Goffman, Baudrillard, and Debord and how their ideas play out and are in some ways energized in an age of net locality. Whether you agree with their proposed new form of socio-technical configuration "net locality" there is much to learn here if you study or design mobile and location-aware computing. Interesting ideas based upon where the internet and real life intermingle. The examples are dated by two or three years (an eternity in internet time) but are still of considerable substance. Substitute the references out and you have a winner. 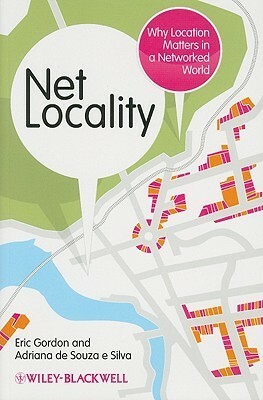 Many interesting ideas about locality, neighborhoods, and cities, and how they affect and are affected by the internet. A workman-like summation of recent and contemporary locative media initiatives.Marred by a jerky wrting style, with very little flow.